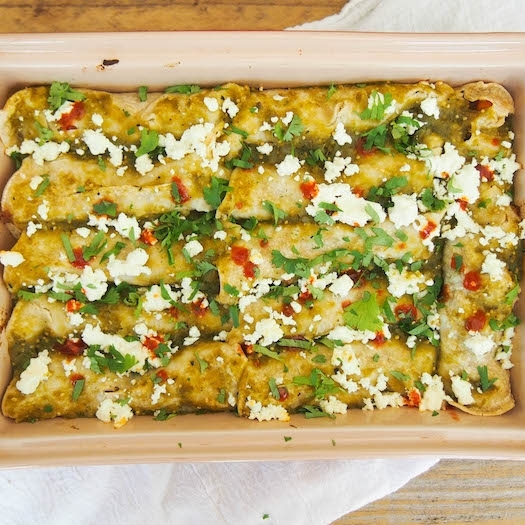 This recipe for vegetarian mole and sweet potato enchiladas with tofu is pure comfort food. 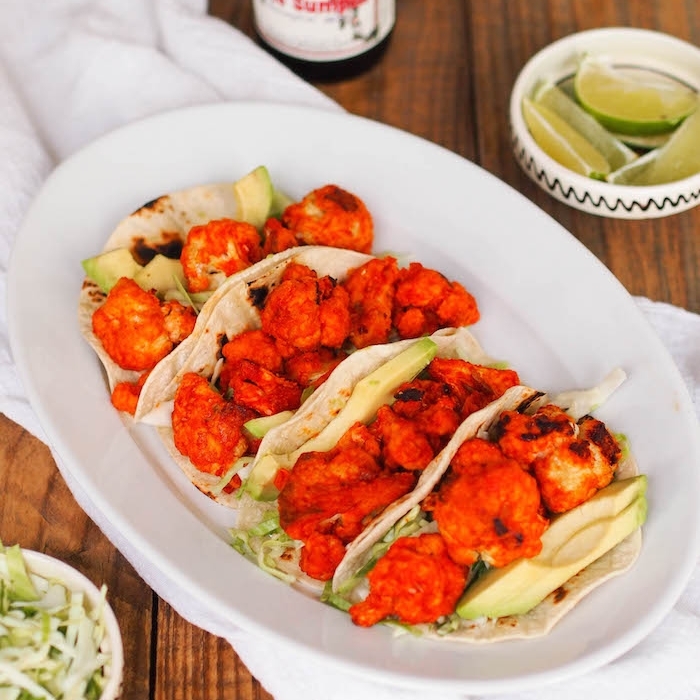 Savory with a little sweet and spice! A few weeks ago, I opened up my freezer and suddenly realized that it's become the place where tupperware containers go to die. Currently in my freezer are three separate open bags of frozen peas, 7 types of frozen fruit including a bag of what I think is frozen pineapple from last year that got buried on the bottom, 8 bags of different nuts and seeds, frozen rolls of bacon, a fruitcake that came in a gift package two years ago which we never ate because...well, fruitcake, and finally at least 30 something ice packs because you never know when you'll need 30 something ice packs. Me thinks it's time for a freezer cleanout. Let's start with the mole sauce leftover from these vegan mole chiliaquiles! 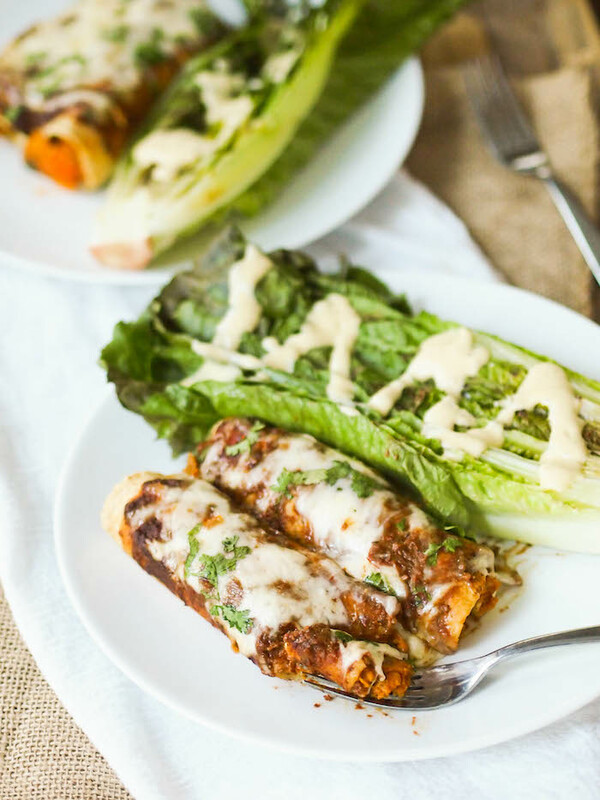 These enchiladas are filled with sweet potato mashed with sauteed onions and jalapenos, seared tofu and topped with a sweet and spicy homemade mole sauce and melty monterey jack. It's comfort food to the max. If you don't feel like making your own mole sauce, which admittedly takes quite a few ingredients, purchase premade mole sauce. I've tried this one by froterra and it's pretty darn tasty. Wrap tofu with a clean dish towel, place on a plate and weigh with a heavy pan to press dry for 30 minutes. Steam sweet potatoes 10 minutes until tender. Set aside to cool. Cut tofu into 1/2 inch cubes. Heat 1 tablespoon olive oil in a large skillet and add tofu. Cook until golden, about 7 minutes total. 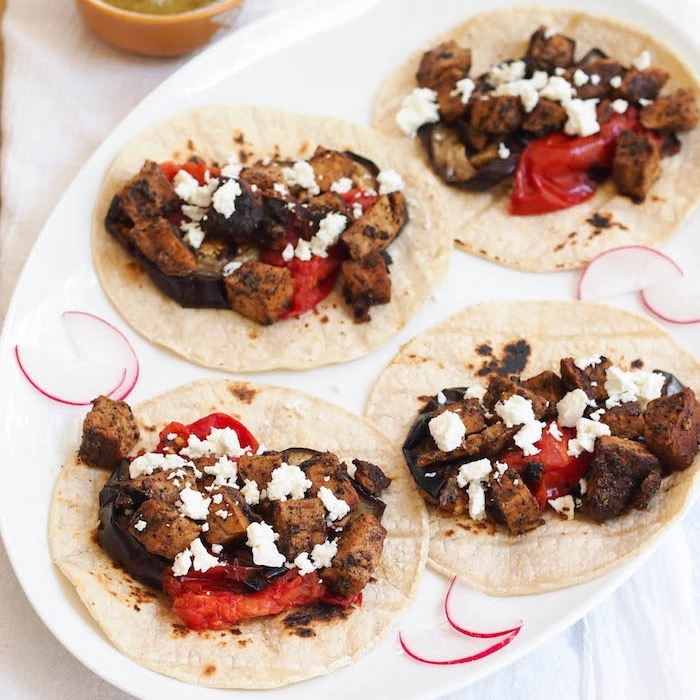 Remove tofu and heat additional tablespoon olive oil in a skillet. Add onion, garlic and jalapeno, season with salt and saute until tender and golden, about 7 minutes. Add steamed sweet potatoes and mash together. Season with salt and pepper. Preheat oven to 350 degrees. Divide the sweet potato mash between the corn tortillas. Divide the tofu between the tortillas. Wrap into a roll and place in a large casserole dish. 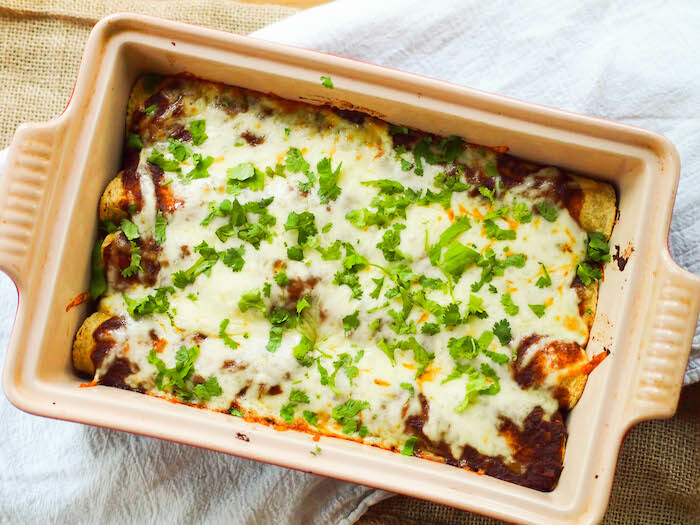 Top with mole sauce and shredded cheese. Place in the oven and bake 30 minutes.